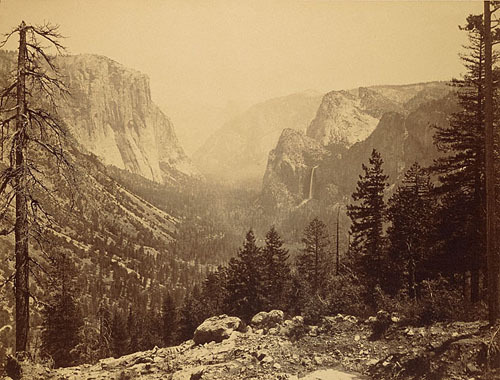 Carleton E. Watkins, The Yosemite Valley from Inspiration Point, ca. 1883, albumen print, 15 5/8 x 20 1/2". If the concept of place in photography has shifted throughout history, “A Sense of Place” examines these shifts in rich detail through the work of more than forty artists from the past two centuries. Beginning in the 1840s, a scientific approach to the medium gave rise to photographic “documents” such as topographical ordinance survey studies—like the one on view here by Carleton E. Watkins, The Yosemite Valley from Inspiration Point, ca. 1883. Later, in the post–World War II period, photographers suggested metaphoric meaning embedded in photographed sites, such as the socially charged American landscapes of Stephen Shore’s “Uncommon Places,” 1973–81, an iconic series included in the exhibition. Another recent development has been the use of photographs to express place through material manifestations, as when a physical accumulation of images functions as a sculptural installation: For Erik Kessels’s 24-HRS in Photos, 2013, for example, he printed every digital image uploaded to Flickr during a twenty-four-hour period. Installed in floor-to-ceiling piles, as if sand dunes had been poured into the gallery, the prints of 1.4 million vernacular images reflect—both as individual images and as aggregate heaps—the overabundance and barrage of photographic reproduction we face in daily life. Other series reflect on content through their modes of installation. Lee Friedlander’s “America by Car,” 1992–2009, is hung uniformly in three rows, but with tight irregular gaps between images, as if to echo the constricted space of the automobile that is used as a framing device in each image. In another gallery, nineteenth-century landscape photographs are installed along a single meandering horizontal line that undulates up and down as if re-creating, in the overall viewing experience, the rolling landscape seen by the photographers. Such unconventional hangs highlight sensibilities pertaining to place both historically and within the framework of contemporary display—sensibilities that are complicated by the digital nature of photographic imagery as it inescapably shapes our perceptions of place both inside and outside the gallery.